Leave it ajar, wait for someone to reveal the secret behind the mirror. Open it up like a showcase, and share the stories of your precious and beloved jewelries. Or lock it up, make it a secret behind the mirror. What's in there? Only you would know. All the things you need to be pretty are here. It's more convenient to compare and choose the accessory that will make your day when they're placed the way the jewelry store or cosmetics shop does. 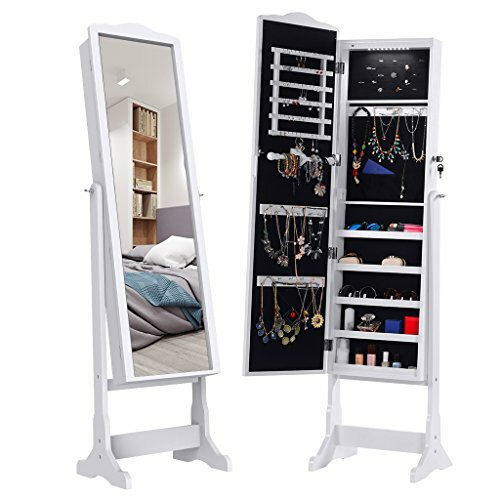 Your daily makeup will be easier and faster with the help of our jewelry armoire. We believe that a single product can absolutely make your life more enjoyable. With this LANGRIA jewelry armoire, you can simply sort your precious jewelry and cosmetics in an organized way. No need to search for the missing earring, no need to untangle the necklace!